Mainstream MMA may be on a rare hiatus for this upcoming weekend, but there’s a wealth of professional wrestling due to take place in the New York City region, highlighted by WWE's annual showcase, WrestleMania 35, on Sunday night. Mixed martial arts has always had a close relationship with pro wrestling, and this week is no exception, as major wrestling promotions will be hosting events from Wednesday through Tuesday, featuring some manner of MMA crossover every day. And with that crossover comes an opportunity for new fans to be made. Take the biggest show of the weekend, WrestleMania 35. Two of the three most important matches of the night feature former UFC champions. Brock Lesnar defends the WWE Universal title against Seth Rollins, while Ronda Rousey faces Charlotte Flair and Becky Lynch in the main event – the first women to headline WrestleMania in the 35-year history of the show. That alone tells you how important Rousey is to the space, as her presence helped create the opportunity for that barrier to be broken. That’s not the only MMA crossover to be found in WWE this weekend, however. Matt Riddle and Shayna Baszler are both scheduled to take part in title matches at WWE NXT TakeOver on Friday. They’ve quickly become fan favorites in that WWE brand, and their matches are expected to be among the best of the weekend. Then there’s Sonya Deville, another woman featured on WWE television that has a background in professional MMA. WWE recognizes the potential for crossover between the two forms of sports entertainment, and the rest of the industry has followed suit. On Thursday afternoon, former UFC Heavyweight Champion Josh Barnett is promoting a show called BloodSport, named after the famed movie. Barnett, an MMA competitor that has worked with major promotions like New Japan Pro Wrestling, is one of many MMA fighters that will be at the event. Frank Mir, Tom Lawlor, Minoru Suzuki, and others will be taking part in this event, which is expected to have a “shoot fight” feel to it. There are more than 35 events scheduled throughout the week, certainly enough content to satisfy professional wrestling fans, but this is also the kind of week that can attract both lapsed and non-wrestling fans from MMA. The relationship between the two is often looked at in a negative light, particularly by fans of one or the other, who often take shots at one another. 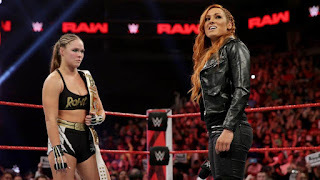 But if the athletes can see that there’s value in moving back and forth between the two forms of entertainment, then perhaps the people that watch their performances will be able to appreciate the connection between MMA and professional wrestling, the high points of sports entertainment. With the UFC on hiatus, professional wrestling takes center stage this week. And with this many events on tap, there’s something for everyone to enjoy, even the MMA fan that might not otherwise give MMA’s not-so-distant cousin a shot.